The second “Beat Presser Evening” takes place on 21 July, followed by a third and final on 8 September. Don’t forget, the exhibition closes on 3 October 2011! At these events, Beat Presser talks about working with Klaus Kinski and Werner Herzog on the films Fitzcarraldo and Cobra Verde and about the wonderful photographs he produced out of those sessions and the Paris Madame Claude portrait session. I won’t understand that much since my German is rusty but I’m hoping to get an interview (in English!) with Beat Presser on 21 July, so expect some kind of update at the end of July or early August when I am back from my holidays – I’m already incredibly excited about the exhibition, about seeing Klaus Kinski’s outfits from Fitzcarraldo and Cobra Verde, and about meeting Beat Presser who took such fabulous portraits of Klaus. Photograph by Th. 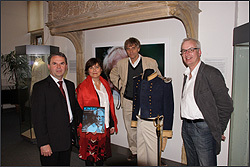 Hölscher: (from left to right) Director of the Museum Dr Lothar Hyss; Vera Pechel, designer of the Kinski book; Beat Presser; Klaus Kinski’s uniform from Cobra Verde and Dr Martin Steinkühler, the curator of the exhibition. I don’t think the Westpreußischen Landesmuseum has made enough of these events or promoted them widely enough, so do spread the word. It’s only 6 Euros to attend and you get to see the photos and Kinski’s clothes, hear Beat Presser’s stories and purchase books (the exhibition catalogue pictured above and reviewed on this blog, plus the earlier Kinski Porträtiert von Beat Presser, arte Edition, and the Werner Herzog – Beat Presser book, arte Edition) and posters and booklets all at very reasonable prices. To avoid disappointment, take cash with you as I understand that the Museum doesn’t have the facilities to take credit card payments. 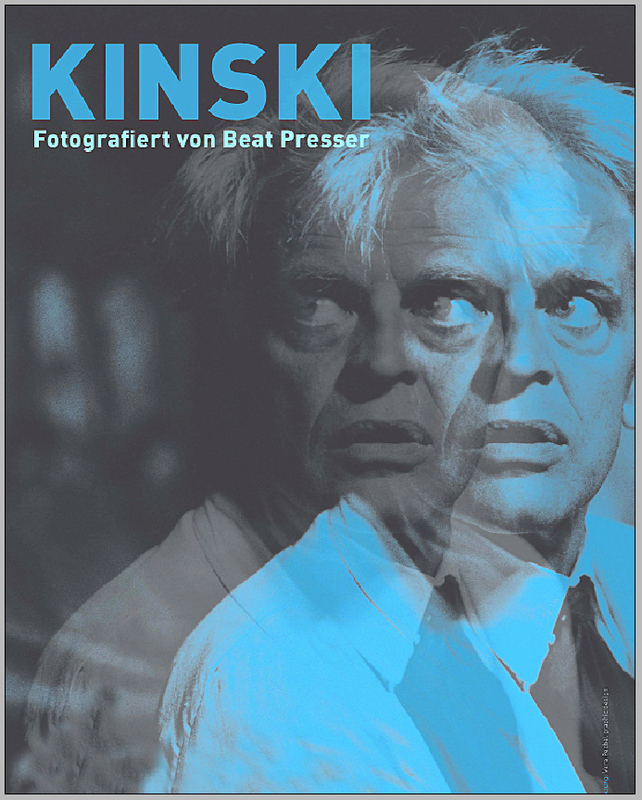 This entry was posted in Other Kinski Stuff, Photos and tagged Beat Presser, Beat Presser Kinski book, Beat Presser Kinski Exhibition, Cobra Verde, Dr Lothar Hyss, Dr Martin Steinkühler, Fitzcarraldo, Kinski-Abend mit Beat Presser, Klaus Kinski, Madame Claude, Th. Hölscher, Vera Pechel, Werner Herzog, Westpreußisches Landesmuseum. Bookmark the permalink.